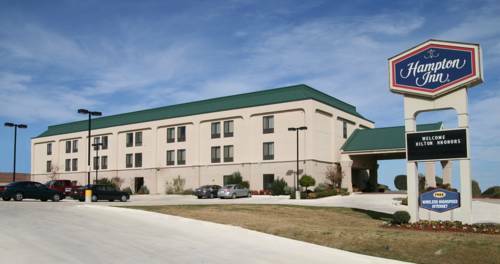 The Hampton Inn Kerrville hotel is located off IH-10 in Kerrville Texas in the heart of the Texas Hill Country. Area attractions include the Kerrville Camera Safari Family Sports Center tennis fishing boating parks shopping malls nature centers theaters and museums all within 3 miles of our hotel. A variety of local restaurants including Acapulco Restaurant Cracker Barrel and Luby*s Cafeteria are within walking distance of our hotel. The Hampton Inn Kerrville features 60 rooms all with hill country views coffeemakers and a TV with cable. We also offer connecting rooms hair dryers refrigerators and irons. While visiting Kerrville Texas guests of our hotel will enjoy an array of amenities including our complimentary On the House continental breakfast outdoor pool and spa whirlpool room sauna and meeting facility accommodating up to 80 people. Laundry/valet services guest laundry audio visual equipment and rollaway beds are also available at our Hampton Inn hotel. We love having you here at the Hampton Inn Kerrville. All reservations that do not require a deposit held until 6pm. Late arrivals and after 6pm must be guaranteed with a major credit card or advance cash deposit to hotel. Policy subject to change. - The Shutter Factory Inc.
1.5 million wooden nickels, including the World's Largest, which is over 13 feet tall and weighs 2,500 pounds.